With such a historic and legendary background it is hardly surprising that Cyprus has developed a character which is quite unique. It is blessed with beauty, natural beauty that ranges from golden beaches and rugged coastlines to rolling hills and forest clad mountains, dotted with picturesque villages. Every year approximately two(2) million tourists visit Cyprus, either for vacations - because of the beautiful scenery, the "sweet" Mediterranean climate and the "gold" wonderful beaches -, or for tours - attracted by various archaeological foundings and kingdoms from different ancient periods in history. Eventhough if the Spring and Summer seasons are preferred, the tourism period lasts for the entire year. Europeans can come to Cyprus by just having their passport, without any special papers or visas. Cyprus is connected with two flights every day by air with Greece(Athens International Airport), and with many different countries in the world. It is also connected twice a week with Piereas port of Greece, for unforgettable cruises. In Nicosia,a visitor will visit first of all the old town , which is surrounded by the historic Venetian walls, as well as the very old churches of St.Sofias(after the Turkish invasion, it has been converted into a mosque) and St.Ekaterinis. He will also see the old Armenian, Greek and Turkish neighborhoods with the narrow streets, the Byzantium churches and the tzami.He will also visit the Archaeological museum of Cyprus. The visitor from Nicosia will travel towards the North coasts, where he will find the romantic remains of the Middle-Age castle of St.Ilariou and the monastery of Mpellapais, which is probably the most important of the island. From there you will view the beatiful town of Kyrenia with the Venetian port and castle. Afterwards, he will travel towards the south-east coasts, to the town of Famagusta. In the way he shouldn't forget to stop and view the Greek and Roman remains of the ancient kingdom of Salaminas. Famagusta is surrounded by the huge Venetian walls, where according to the legends and history, remind you the heroic resistance of king Othellos and the Venetians to the Turkish invasion in 1571. 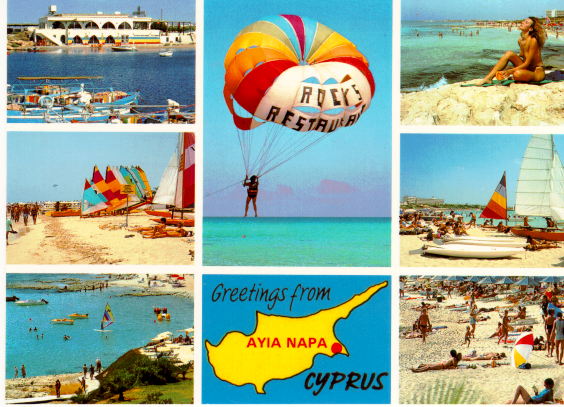 From there you can visit the village of Ayia Napa, where you can enjoy the sea, the sun and the beautiful "gold" beaches. After the Turkish invasion in 1974, this small village became the number one village in Cyprus in tourists attraction. The trip continues towards the south-east coast, to the town of Larnaca with the major international airport of the island, after the Turkish occupation of Nicosia airport in 1974.Larnaka is also an important port for international trade. Then he will travel south, to Limassol.It is a beautiful town(the second in population after Nicosia) and the major attraction of tourists for its night life.There, he will visit the old castles of Limassol and Kolossi, and he will continue his trip towards the north-west coasts.As soon as he will get out of Limassol borders he will see the excavations in the ancient Kingdom of Curium. Travelling across the west coast he will reach the ancient town of Paphos. But in the way he will view the "Petra tou Romiou", where according to the legends is the birth-place of Venus; the ancient Greek God of beauty. In Paphos, he will see the remains of the famous Temple of Venus the Middle-Age castle and the wonderful psifidota of a Roman villa. The districts of Famagusta and Kyrenia, are nowadays under Turkish occupation since the Turkish invasion in 1974. Travelers arriving in the Republic of Cyprus may enter the Republic only through the legal ports of entry: Larnaka and Pafos International Airports, or the ports of Larnaka, Limassol and Pafos. The ports of Famagusta Kyrenia and Karavostasi, as well as the airports in the part of the Republic illegally occupied by the Turkish invasion forces have been declared by the Government as prohibited ports of entry and exit, and no passenger should enter or leave the Republic from these ports.